Click for The Maguire Family History Weekend. We now have archives of the newsletters. Jan 06 2013 Visit our Cool Family Facts page. Dec 18 2012: We now have a GuestBook with a Location Map! Click the NEWS page for more updates! Historians state that McOsker – MacCusker – MacCosker are principally a branch of the MacGuires in Fermanagh, a county in Northern Ireland. 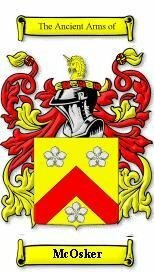 We believe that we are descended from Oscar Mag Uidhir, the great-grandson of Donn Carragh Mag Uidhir, the 1st Prince of Fermanagh. We present information on the McOsker - McCusker - MacCosker Family Tree. Some of this information comes to us from medieval manuscripts, some from 21st century DNA testing, some from myth and legend, and some is plain speculation and conjecture. We will do our best to differentiate between these as we present our case. This website comes basically in two sections. Section 1 Medieval Lineage describes our common lineage, beginning with Donn Carragh Mag Uidhir, the 1st Lord of Fermanagh, who died in 1302. This lineage goes WAY back. We are directly descended from the ancient High Kings of Ireland, and this lineage is well documented and DNA supported. Section 2 describes the DNA Testing we are doing to link our genetic branches together, and explains how you can be a part of this study. We need additional family members to join this project. The more data points we have, the more meaningful the test results will be. Please read this section with a spirit of adventure and discovery!